Galileo In-Orbit Validation four-satellite constellation. In 2011 and 2012 the first four Galileo satellites were launched into orbit. Four is the minimum number of satellites needed to perform navigation fixes. In the year that followed, these satellites were combined with a growing global ground infrastructure to allow the project to undergo its crucial In-Orbit Validation phase. Europe's fledgling satellite-navigation system has achieved a crucial milestone, showing that it's capable of pinpointing locations around the globe. 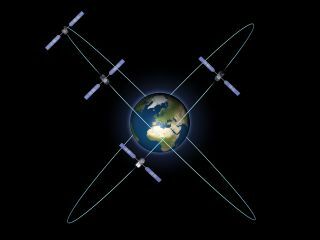 The four satellites that currently comprise the Galileo satellite constellation — Europe's version of the United States' GPS system— have passed a key test called In-Orbit Validation (IOV), European Space Agency officials announced Monday (Feb. 10). "IOV was required to demonstrate that the future performance that we want to meet when the system is deployed is effectively reachable," Sylvain Loddo, ESA’s Galileo ground segment manager, said in a statement. "It was an intermediate step with a reduced part of the system to effectively give evidence that we are on track." The IOV phase began in March 2013, when Galileo's space and ground infrastructure came together to allow the system's first determination of a ground location. The test campaign was a lengthy affair carried out across Europe, officials said. "ESA and our industrial partners had teams deployed in the field continuously for test operations," said Marco Falcone, ESA’s Galileo system manager. "More than 10,000 kilometers were driven by test vehicles in the process of picking up signals, along with pedestrian and fixed receiver testing. Many terabytes of IOV data were gathered in all." The four Galileo satellites— which launched in 2011 and 2012 — performed well during the tests, achieving an average positioning accuracy of 26 feet (8 meters) in the horizontal direction and 30 feet (9 m) in the vertical 95 percent of the time, officials said. The system's average timing accuracy was 10 billionths of a second. Those numbers should get better as more satellites come online. ESA plans to launch six more Galileo spacecraft during 2014, potentially allowing the constellation to start providing its initial services by the end of this year, ESA officials said. The Galileo satellite navigation network will eventually consist of 30 satellites. The total price tag for the project, which has suffered from cost overruns and delays, is estimated to be around $7.5 billion.